Many of us as people of faith experience a transformation similar to the birth of the baby birds. God provides a safe home for us and warms us with the love of a community of believers. We hatch into a bright and loving place where we are feed the Word of God and nurtured in our immaturity. As we grow and are loved we acquire the feathers and wings to fly. We feel safe and secure in our nest and many of us choose never to fly away from it, we prefer to sit in the nest and to only speak God’s words within the safety of the nest. God did not mean for us to stay in the nest forever it is a place of security that we can and should always return to but not live within. the call to take the Gospel to the whole world as been for many reserved to the clergy/missionaries-this is a mistake. The mission to pronounce the word of God is for all. Remember Gerasene the demoniac who wanted to follow Christ after being relieved from the legion of demons was told by Christ to go to his people and announce the good news of his salvation(cf.Mk5:19-20); the Samaritan woman is another example who did not quiet the good news that she heard form Christ but went to call others to partake of the same (cf.Jn4:28-30). We must be ready therefore to share with others the love we receive form God and not keep it for ourselves. It’s very interesting that you sent this to me today because I have been caring for a family of birds in front of my home. 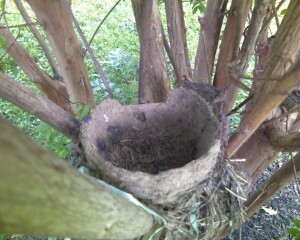 The nest, with the babies, dropped from the tree about two weeks ago. I repostioned the nest in the same tree and put all of the baby birds back into it. The mother and father returned then resumed caring for them. They all left the nest on Saturday.